Full Size Convertible Bunk Bed Natural Finish Easily converts to two full size single beds. Item is to bring a bright feel to your child’s room and is the perfect solution for a family with limited space. Perfect addition to your modern or classically arranged bedroom. Mattress and related accessories are available separately. Assembly required. 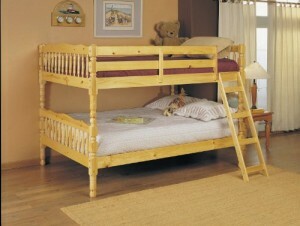 Full Size Convertible Bunk Bed Natural Finish Easily converts to two full size single beds. Item is to bring a bright feel to your child’s room and is the perfect solution for a family with limited space. Perfect addition to your modern or classically arranged bedroom. Mattress and related accessories are available separately. Assembly required. Dimension: 81″W x 58″D x 60″H, Finish: Natural.